I love jewelry… so, so much..
One of my most meaningful pieces is my wedding ring. My grandmother wore a simple gold band until it was worn through from working so hard. My grandaddy surprised her with a beautiful platinum and diamond band one evening. He scrimped and saved for years until he could buy it for her. That platinum ring that my grandmother wore for so many wonderful years was given to me when my husband and I announced our engagement. Our wedding was one of the top two moments in our lives. The other being the day our children were born. As I come up to their year birthday I think about how this year has been – challenging but so incredibly worth it. My babies are the light of my life. 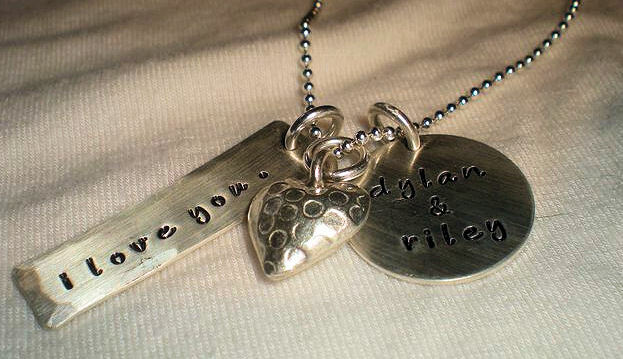 Dylan and Riley noticed the shiny silver around my neck right away. Dylan especially loves to sit on my lap and play with it. He will sit there and touch each charm over and over. It also helps him calm down when he gets upset, gets him focused on something other than what’s upsetting him. Each piece from The Vintage Pearl is custom created especially for you. You can have anything hand stamped. 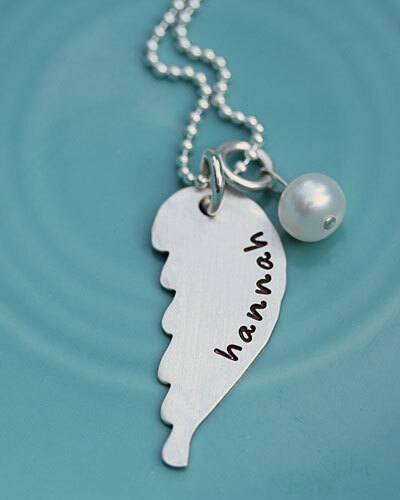 How precious would a piece be as a gift for a new mother, or a grandparent, or a blushing bride? 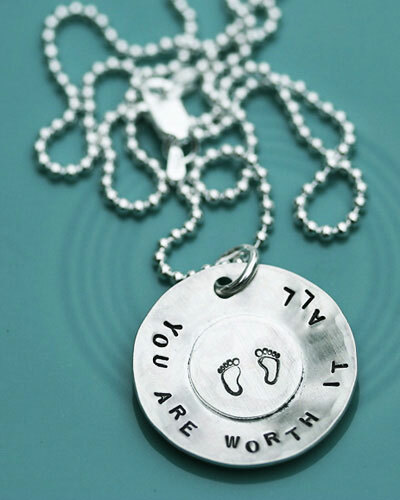 There are also keepsakes such as baby spoons, keychains, and pieces for that special man in your life. Visit The Vintage Pearl. You will find beautiful and affordable handcrafted jewelry for yourself or a gift! One very lucky reader will win a $50 Gift Certificate to The Vintage Pearl! Visit The Vintage Pearl and tell me your favorite item! Tweet about this giveaway! RT @mommywantsfree @thevintagepearl Win a $50 GC to The Vintage Pearl! Ends 3/6 #giveaway www.tinyurl.com/mommywantspearl (1 entry per tweet per day) Giveaway ends Sunday 3/6 at 11:59pm PST. Winner will be chosen via random.org & has 48 hours to respond to my winning email! Please make sure to include your email in each comment unless it is in your profile. Giveaway open to US! I love the eclectic charm bracelet! I am loving the square names with heart necklace! I love their items. Glad I took a look. Thanks! I couldn’t decide which I like best: the Chunky love necklace or the Layered mother of pearl necklace. Both are beautiful. I really like the daddy dogtags. the eclectic charm bracelet is my favorite!! i like the vintage pearl on facebook! I love the dainty layered hearts necklace! My favorite item is the "large layers" necklace. I liked the Vintage Pearl on Facebook. I subscribed to Mommy Wants Freebies email. I like the simple love with a copper heart necklace. I like the Vintage Pearl on FB. I follow MWF via Twitter. I follow Vintage Pearl on Twitter. I entered the Trukid giveaway. ummmm…I want one of each! I love the ‘dainty layered hearts’, ‘dainty drops’, and the ‘sterling silver cuff’. New fan of The Vintage Pearl. Left comment & tagged MWF. You already know that I am a fan of MWF! Button #3…really you know where! I would love to have the sterling silver cuff with my boys names on it! Pretty much everything is great, but I especially love the "You are my Sunshine" necklace. I LOVE the Vintage Pearl — I’d love to get the Sign language "I Love You" necklace if I were lucky enough to win. I love the vintage silver charms necklace. I absolutely love "Love you to the moon and back"
I liked the Vintage Peal on facebook! I liked Mommy Wants Freebies on facebook! I also entered your Wee Urban giveaway!